No moonlight alighted my path to aid me. Halting to catch my breath, I focused on the night sounds. Branches, with rustling leaves, creaked in the wind, a screech owl trilled a mournful melody, and midges hummed past my ear. Upon hearing rushing water, I reasoned that I could follow its course and escape those who sought my death. Unless the hounds were sent aft me, the advantage was mine. Unlike my pursuers, I had been taught to move swiftly and silently through the forest. Reaching the bank of the stream, I kicked off my leather shoes, for they were a hindrance. I dipped my toes into the water and felt the cool and slippery moss-covered rocks. Near me, a fish splashed. On the path behind me, I heard a familiar voice, hailing me and assuring me that no harm would come to me. For a moment, I turned, contemplating whether I should continue on or turn back. Always steadfast in his devotion, Henry would not harm me. But was he alone? My back stung from the whip’s lashes. Like spiders waiting in their webs, those close to him could have spun a trap. He called to me once more. I quivered with irresolution, when a voice inside me urged me to continue forward. Though my life with Henry had ne’er been true, I feared what lay ahead. ‘Twas his voice. So many years had passed that I had nearly forgotten the sound of it. Unashamedly, tears sprang into my eyes. Disregarding those who followed me, I called out to him in the tongue that had been forbidden to me for so long. Heeding his advice, I forded the stream. The water churned around my feet whilst fish kissed my toes. Near the middle, the water swirled about my waist. I slogged through it and reached the far bank, when suddenly I was lost. Raging shouts came from the opposite stream bank. My heart pounded at their nearness. If I did not seek refuge, the mob would be upon me. I could now see their torches, and my breaths quickened. In the breeze, my beloved whispered, and I followed his voice ’til an elegant white hound stood afore me. I now knew what I must do. The dog’s body was made for coursing, but he kept a slower pace in order to guide the way. Deeper and deeper into the forest we traveled. I sought shelter in a dark opening within the roots of an immense oak. 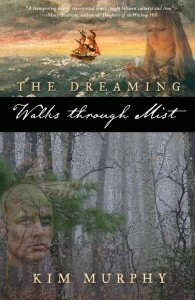 Instead of blackness surrounding me, a thick mist engulfed me. The clammy dampness upon my skin raised the hairs on my arms. The hound was my salvation, and I latched onto his leather collar. On and on I faltered through the fog with the dog tracing a huge circle. I felt the rough, bare wood of a rocking and swaying ship neath my feet. A wave of nausea overcame me, and I clutched my stomach with my free hand. The hound failed to break stride. Onwards. From a nearby branch, a crow cawed. Suddenly, I thought of a tiny lad vanishing in a similar mist, ne’er to be found again. Assured that my pursuers would reason that I suffered from the same fate, I continued walking along the arc. When my beloved’s voice returned, I signaled the hound to halt. He kept going, and the loving voice faded. With a twinge of remorse, I thought of Henry. He, too, had loved me. A love that I could ne’er return, for my heart had always belonged to another. The mist grew thinner, and he whispered in my ear for me to follow the light. Up ahead, I spied what looked like thousands of torches. As I emerged from the fog, the dog vanished. I blinked in disbelief. How could so much light be possible in the night sky? I scanned about me. Lights upon lights, swarming with people. And clattering noise. I pressed my hands to my ears to block the racket. The thoroughfare had a surface the likes of which I had ne’er seen. Where am I? Which lights should I follow? I stepped into the road to escape. More lights chased aft me, blinding me. I froze in my path, deafened by a piercing sound and sudden screeching. The earth trembled, and I was flying afore striking the pavement. I closed my eyes to the pain. Soon, my beloved, I will join you. The full version of this novel is now available from Coachlight Press in Trade Paperback, and from Amazon in Kindle format.